Like his friend and fellow illustrator Frederic Remington, Edward Windsor Kemble moved to Ridgefield from New Rochelle, N.Y., and wound up dying here not long afterward. Kemble was born in California in 1861, a son of the founder of the first daily newspaper on the Pacific Coast. By age 20 the largely self-taught artist was living in New York City. In an era before photographs were used in periodicals, he worked as an illustrator at the Daily Graphic, the first illustrated daily newspaper in New York, and did drawings for other publications such as Life and Harper’s magazines — Life was published by Ridgefield’s John Ames Mitchell. 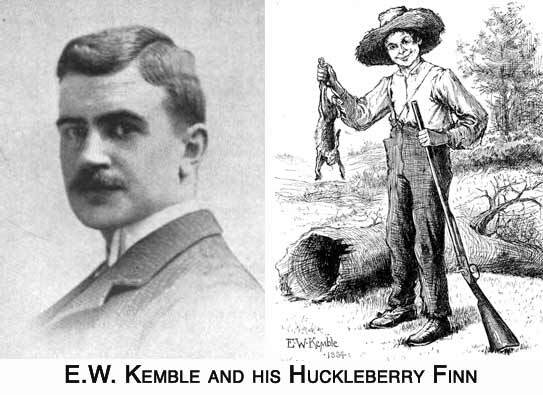 Still in his early 20s, Kemble was hired to illustrate Adventures of Huckleberry Finn, now considered one of the greatest American novels of all time. He went on to do other work for Twain, including Puddn’head Wilson. His “understanding and sympathetic” portrayal of black Americans in Huckleberry Finn was considered remarkable at the time, his obituary in The Ridgefield Press said. However, he himself admitted he had known hardly any blacks, and that the model for Jim (and most of the other characters, including Huck) was a teenage white boy named Cort Morris, who would pull down a black wool cap over his face to create the effect of being black. Other publishers were taken by Kemble’s portrayal of Jim and approached him to do illustrations for works about blacks. Kemble, who had never been south of Jersey City, decided he needed to learn more about his subject, and for many months lived on a cotton plantation in the South to gain firsthand knowledge. He wound up being commissioned to illustrate Uncle Tom’s Cabin as well as an early edition of the Uncle Remus stories. While his illustrations of blacks often displayed “great empathy,” they sometimes reflected “the most outrageous of stereotypes,” one biographer said. Kemble also drew scores of political cartoons for newspapers and was so effective at it that President William Howard Taft once remarked that “Mr. Kemble and his satiric drawings were one of the few forces in the country that he feared,” The Press obituary said. Kemble moved here around 1930 to live with his daughter on Wilton Road West, where he enjoyed gardening and gatherings with friends. He died in 1933 at age 72 and is buried in Mapleshade Cemetery.